We collected our three Dominique chicks on 29th June 2012. 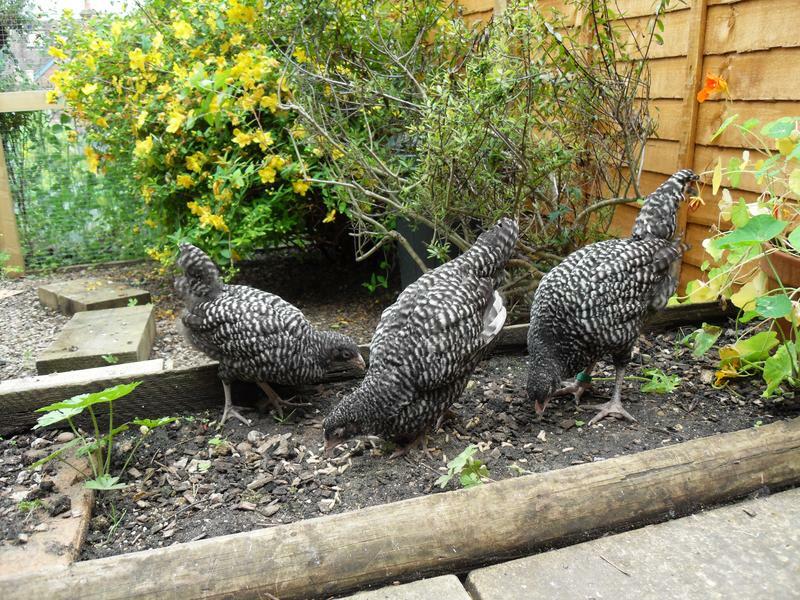 Dotty on the left of the photo was 1 month old while Pepper in the middle and Poppy on the right were two months old. We had been waiting for months for three to hatch and become old enough for us to take. I chose these pure breeds because they had all the qualities I was looking for in my first flock. They are small, quiet, friendly, hardy, good egg layers and pretty. I was so excited to have my little flock at last. This photo was taken on 21st July 2012. We had only had the chooks for two weeks and I was becoming suspicious that Poppy was a cockerel. By the time we had the chooks for a month I was certain. I had chosen their names to be descriptive and as they were speckled went with Pepper as in pepper corns, Poppy as in poppy seeds and Dotty as in, well, dotty! I read that Poppy is Greek for pappa so maybe it was fate. We rang the farm in Dorset where we got them from and arranged to take Poppy back where he would be kept to breed from. They said we could take a couple of different chicks back with us which we could choose on the day. 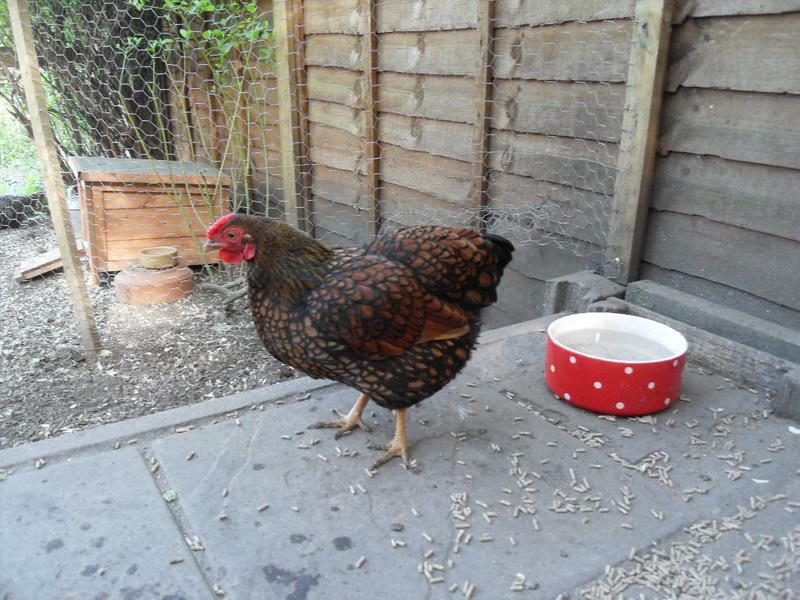 On 24th July 2012 we returned Poppy and the farmer suggested he choose us two hens of a similar size and age. We came home with Bluebell a chalkhill blue who would lay blue eggs and Treacle a longtown brown who would lay dark brown eggs. 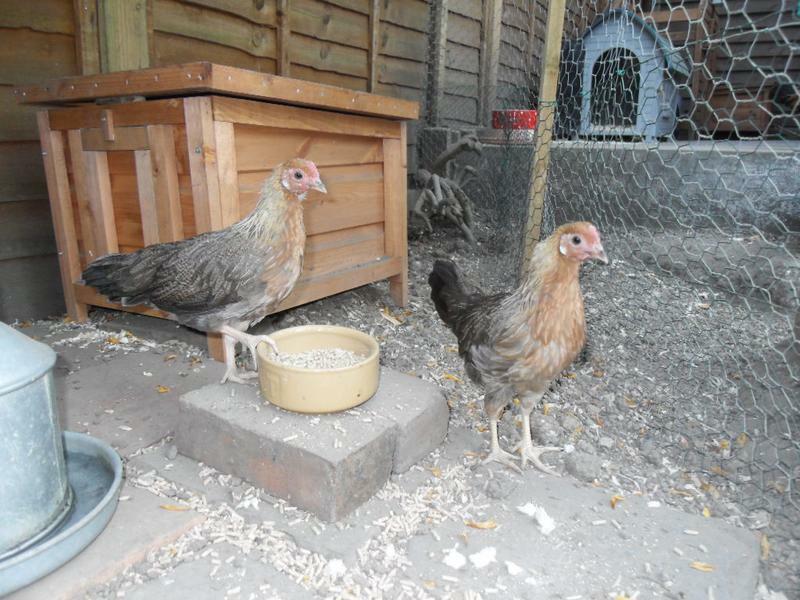 Again I went with descriptive as Bluebell has blue in her breed name and egg colour and Treacle was treacle coloured. They were about three months old, the same as our girls and the farmer said the journey home was enough time for them to get used to each other as they were only young. They soon become one flock and liked to do everything together. 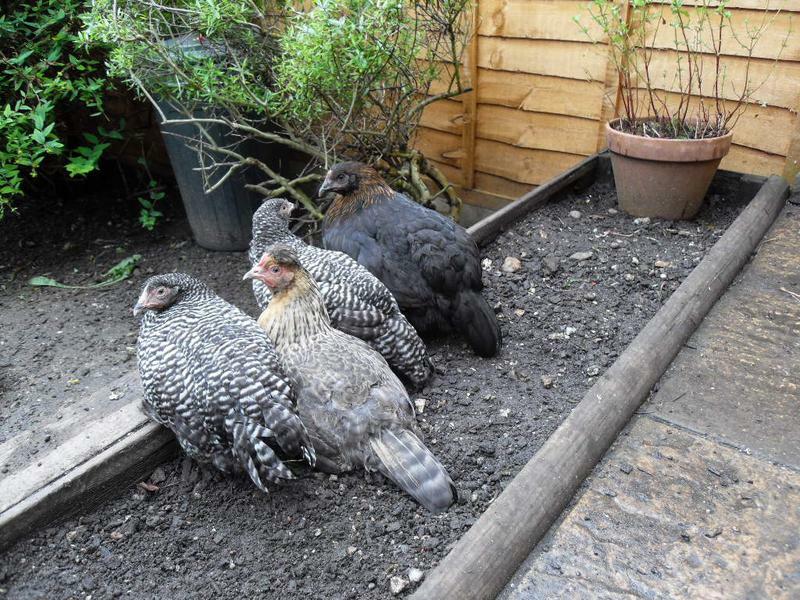 In the photo above Pepper is on the left, then Bluebell, then Dotty and Treacle on the right. This photo was taken on 8th November 2012 when Dotty was seven months old. Dotty had sat on my lap when I sat on my little chair but suddenly took to jumping from the ground to my shoulder which I thought was pretty impressive. She would also jump on my back whenever I bent over. 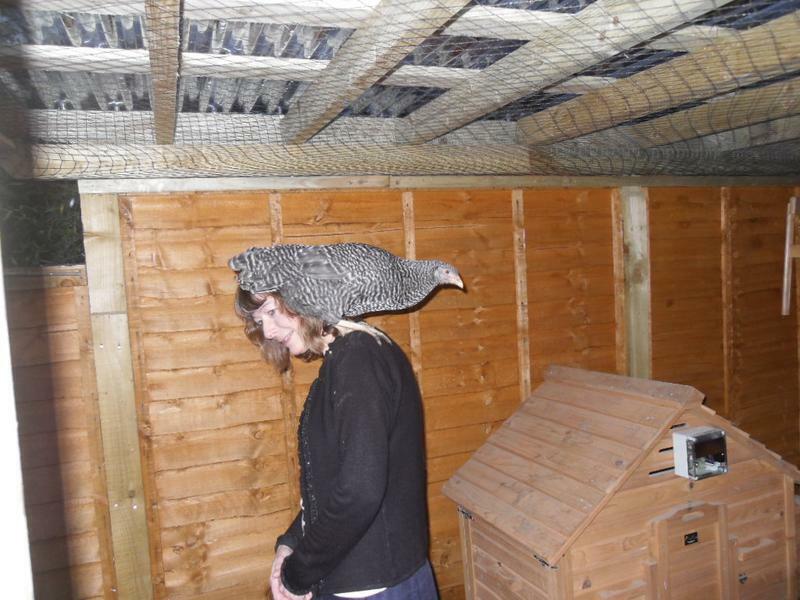 Dotty continued to do this all the time I had her, she loved to get on my shoulder and every morning as soon as I went through the gate she would jump straight to my shoulder as if it was her way of greeting me. This photo was taken on 28th June 2013 when we had had the girls for a year. It is my favourite photo of them together. Treacle is on the left, then Dotty, then Bluebell and Pepper on the right. Unfortunately we lost Treacle. She had only been laying eggs for three months so was really only just grown up. She stopped laying and became unwell. After several visits to the vets she was put to sleep on 14th February 2013. We think it was something internal as the vet couldn’t find anything wrong. She had had two injections, an x-ray and antibiotics but nothing helped. I had been hand feeding her treats but she then refused to eat at all and would only sit in the nest box or on my lap. I couldn’t let her suffer any more and I held while she had her injection and cried buckets over her. It was so sad and the girls looked for her the next day. She had been their head hen. After the loss of Treacle there was such a feeling of something missing that we decided to add to our little flock. 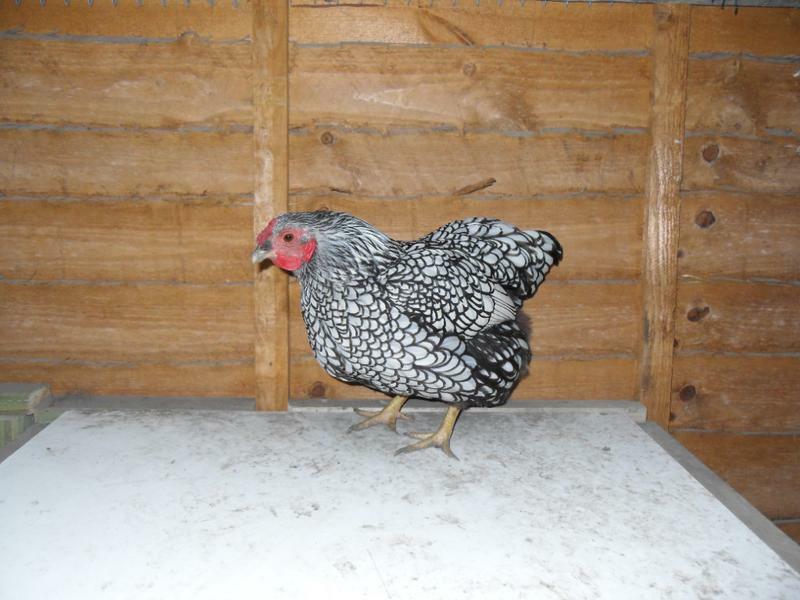 I decided that I would like to add two bantams and started researching what was available in our area. 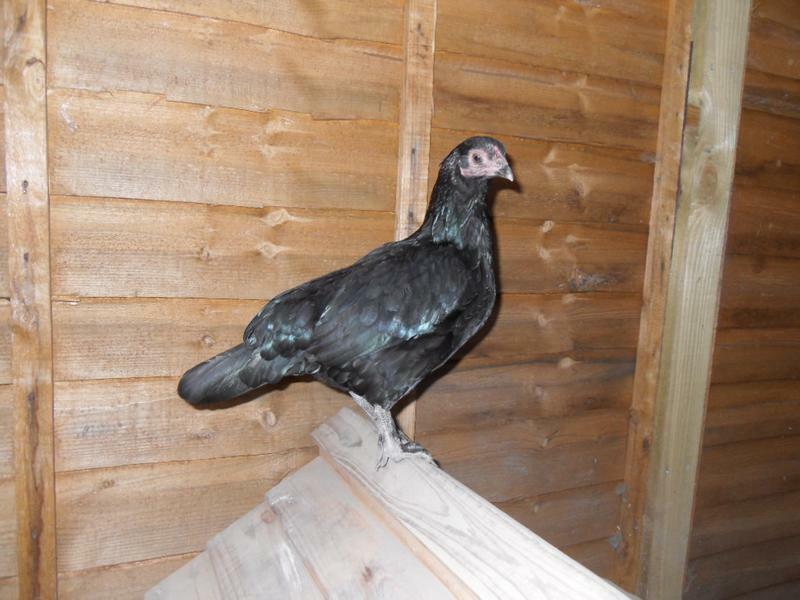 I found a lady who had two bantam vorwerks, also pure breeds, quite near to us. We collected them on 30th April 2013. Staying with descriptive names, I called them Amber and Honey because of their golden colour. I named the more feisty one Amber as Honey seemed a more gentle name in keeping with her more gentle nature. I hadn’t realised how difficult integrating them would be and we had to divide the run into a separate section for them. It took three weeks before they were properly together as one flock. This is my favourite photo of the five of them together. Amber is on the left, Honey next, Dotty next, then Bluebell and Pepper on the right. This is the best close up I have of the little girls. 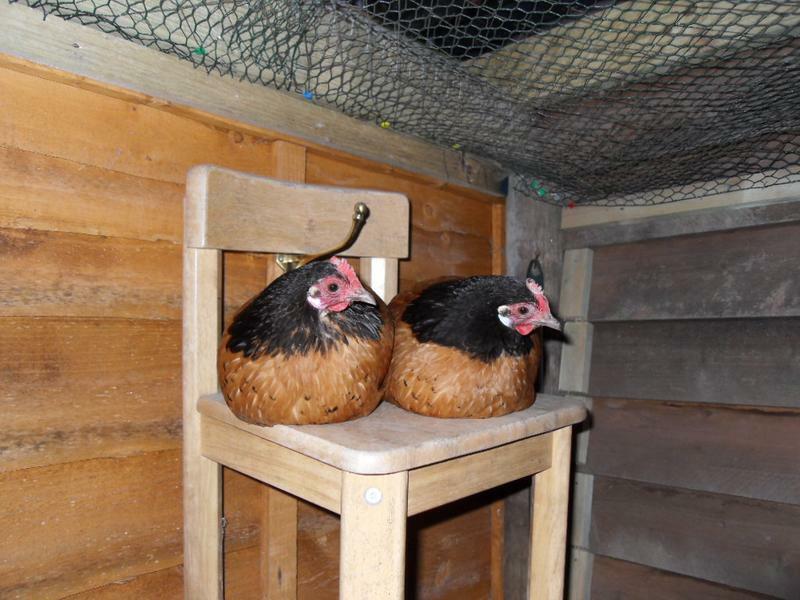 They liked to sit on my little chair which hung just under the roof. Amber is on the left and Honey on the right. After a lot of thought I decided to add two more bantams to my flock. Amber had always struggled with her egg laying and would look quite unwell. I thought if I were to lose her that would leave Honey as the only little girl amongst big girls. I did some research and found a farm in Amersham that was only half an hours drive away and had bantam silver and gold laced wyndottes. I rang and the farmer and he agreed to sell me one of each. We went to collect them on Saturday 5th April 2014. I intended to put them in the separated part of the run for a week so that they could see and hear each other but not get to each other. I decided to stick with descriptive names and called the gold one Topaz and the silver one Sparkle. I was shocked to find that on the first day Bluebell and Topaz had pecked each others combs through the wire and made each other bleed. They were running at each other through the wire. It soon became clear that Bluebell wasn’t going to accept them just like last years little girls. My friend Jackie came to see them on Monday 7th April 2014. She had always said that Bluebell was her favourite and was saying how striking and individual she was. I said that if she wanted her she could have her and much to my surprise she said that she thought that could work for both of us. We agreed that if it didn’t work out I would take her back. 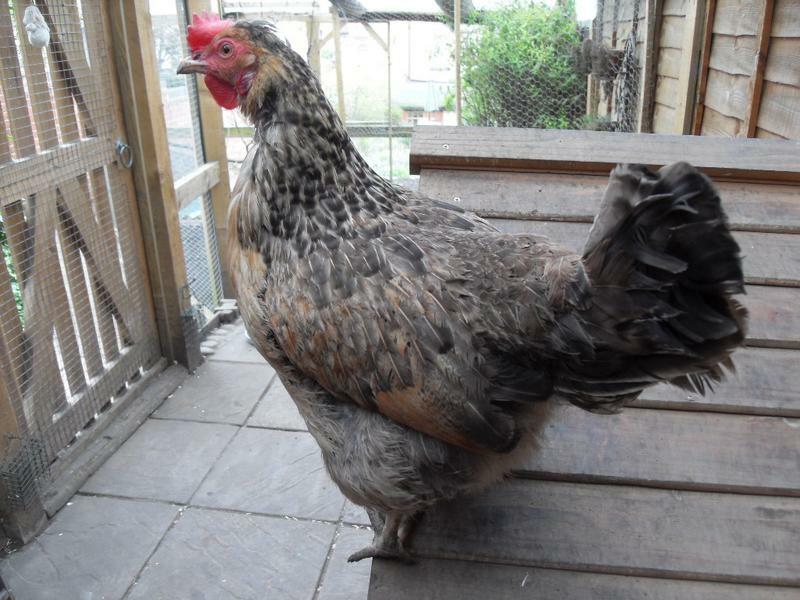 Jackie had four girls of different breeds but a similar size to Bluebell so Bluebell would be one of five similar sized birds. Jackie also has a bigger run and a garden they can free range in. We felt that my run was a bit small for Bluebell. I took Bluebell to Jackie on Tuesday 8th April 2014. Jackie only lives ten minutes drive from me and I could visit Bluebell plus Jackie kept me updated with photos, e-mails and phone calls. Jackie already had a Bluebell in her flock so renamed her Blossom as she felt she would blossom with her flock and get her feathers back in again. I felt emotional at letting her go but knew it was best for my flock and for her happiness. 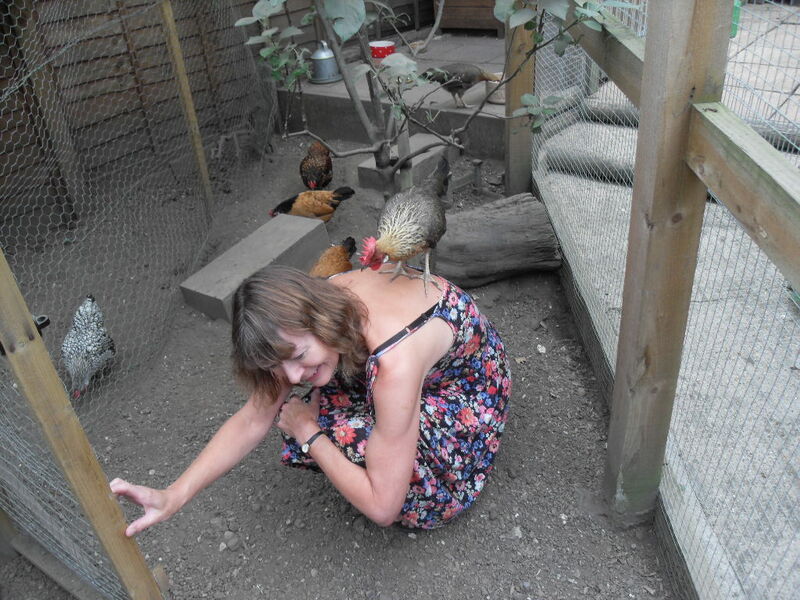 My big girls had never completely accepted her and pecked out her head and neck feathers and she had never accepted the little girls and bullied them. It was soon clear that Bluebell had settled quickly and happily with her new flock and my flock were happier without her. After a week I integrated the girls with no problems. It went so much easier than last year. Topaz soon rose to the position of top hen. 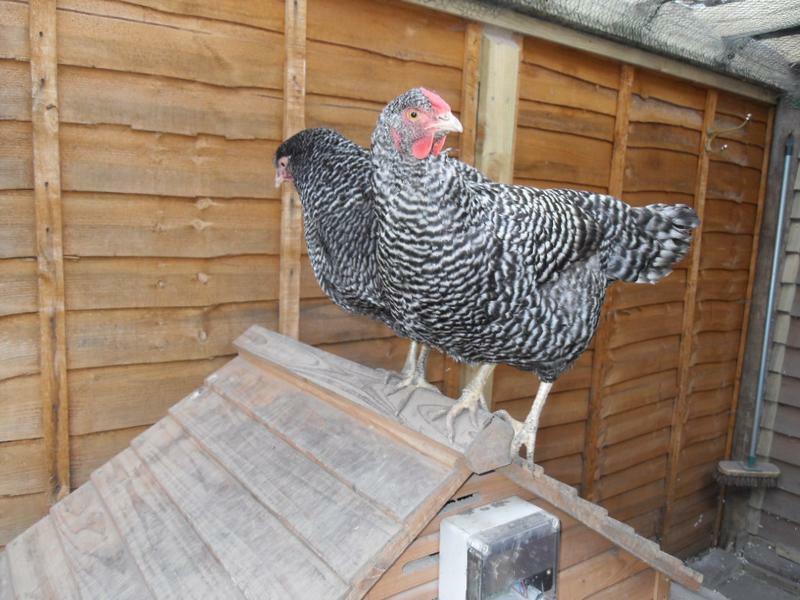 She was feisty and soon showed with a swift warning peck that she was now top and Pepper and Dotty didn’t contest it. There was no comb pecking and no need for the water spray as it was all done with warning stares and warning pecks, sometimes the sort that don’t even connect. 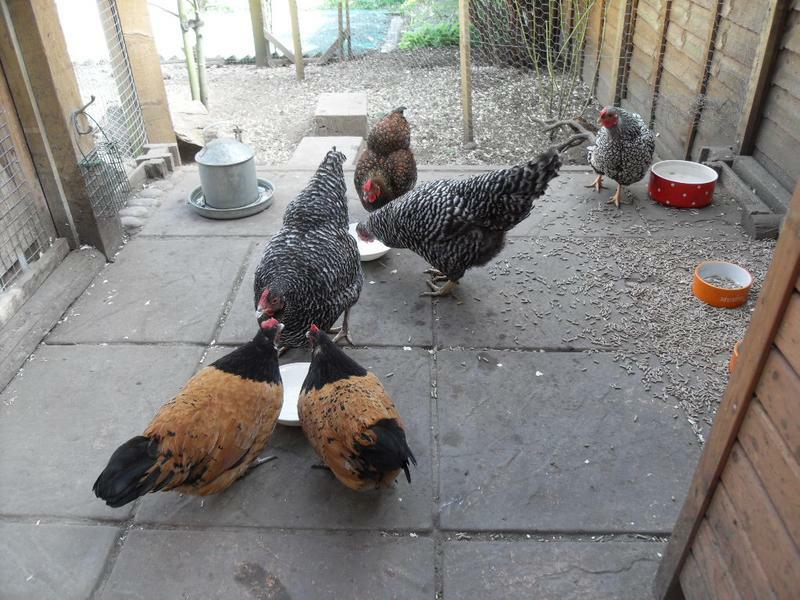 The new pecking order is Topaz followed by Pepper then Dotty, then Sparkle followed by Amber then Honey. I now had a lovely flock of six and all was well balanced and mostly in harmony except for the usual bit of shouting about who should lay their egg in which nest box. 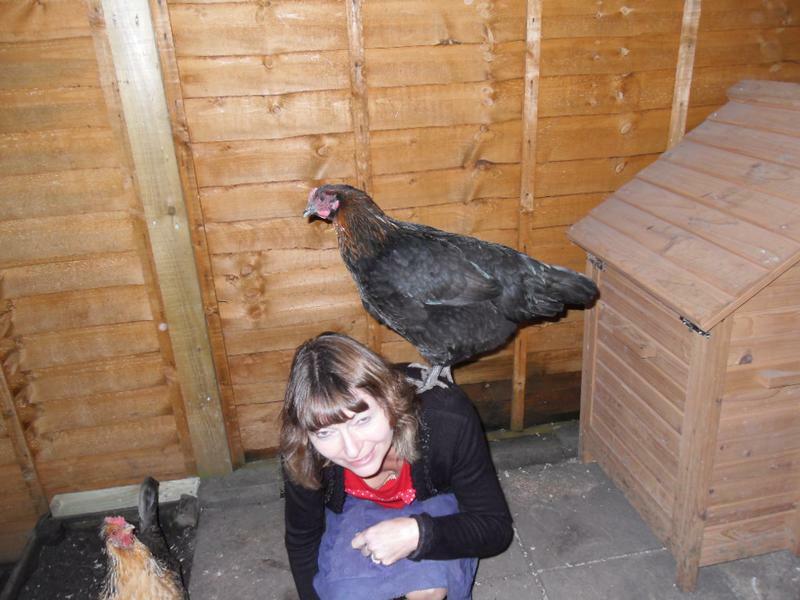 I was very happy with my lovely flock. 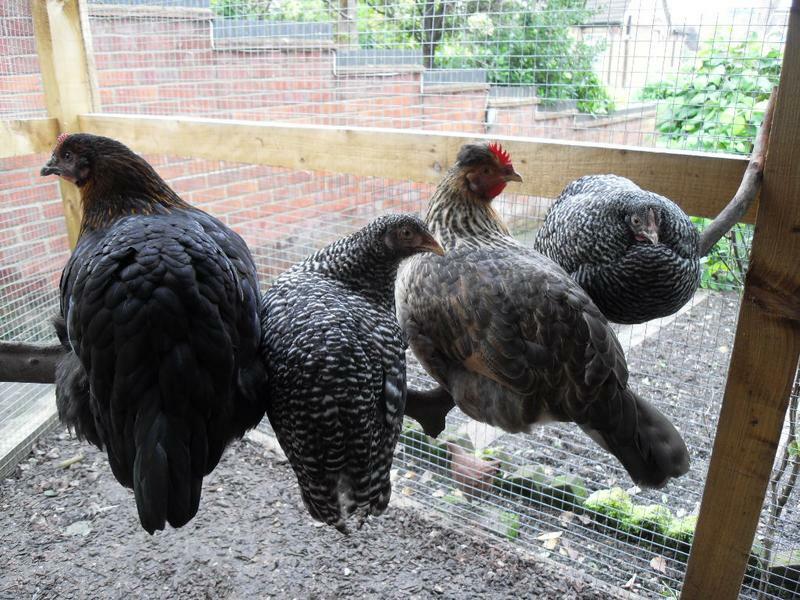 Having had my girls for two years, I had been struggling with a feather plucking problem for eighteen months and nothing I tried made any difference. Pepper and Dotty were plucking each other and all the little girls. I had tried the purple spray, anti peck sprays, water spray when I caught them doing it and finally at great expense doubling the run and separating Pepper and Dotty. Nothing worked. 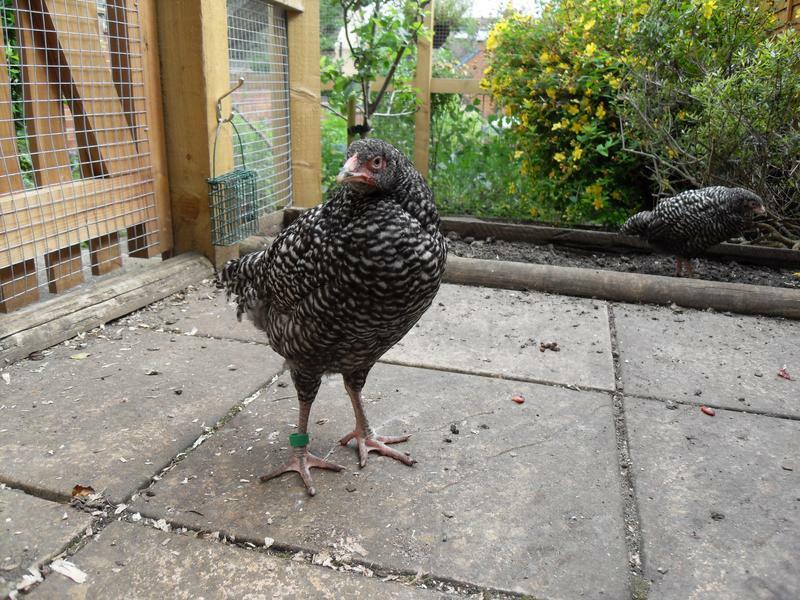 After weeks of separation Pepper had become unhappy and shouted all the time and also plucked Dotty’s head and neck. When I let them together at bedtime she pecked Amber’s, now bare, head. I couldn’t let this go on any more and after the success of re-homing Bluebell with Jackie I decided to look into re-homing Pepper and Dotty. We knew of a farm nearby that has lots of chickens, ducks and geese. I rang the farmer and explained the problem and asked if she would consider taking them. 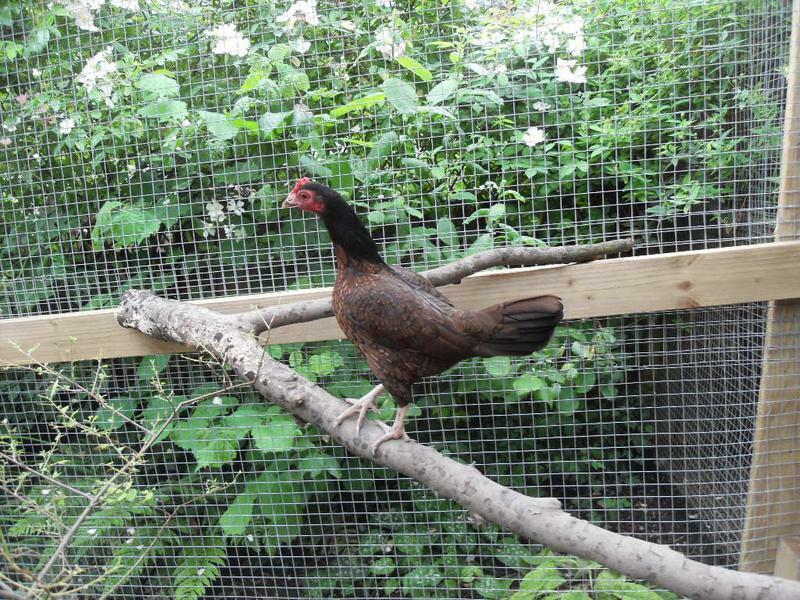 She said she had re-homed other birds in the past including a cockerel and would be happy to take them. We took them to her on the afternoon of 9th June 2014 and she put them in a barn with some of her girls and the cockerel. She said this method worked for her and she would keep them there for four days then let them mix with the rest of her flock and she would look after them to the best of her ability. I cried a bit and found it hard to let them go but I knew in my heart they would have a better life on a farm and I had to do what was best for my flock and it also meant they could stay together. 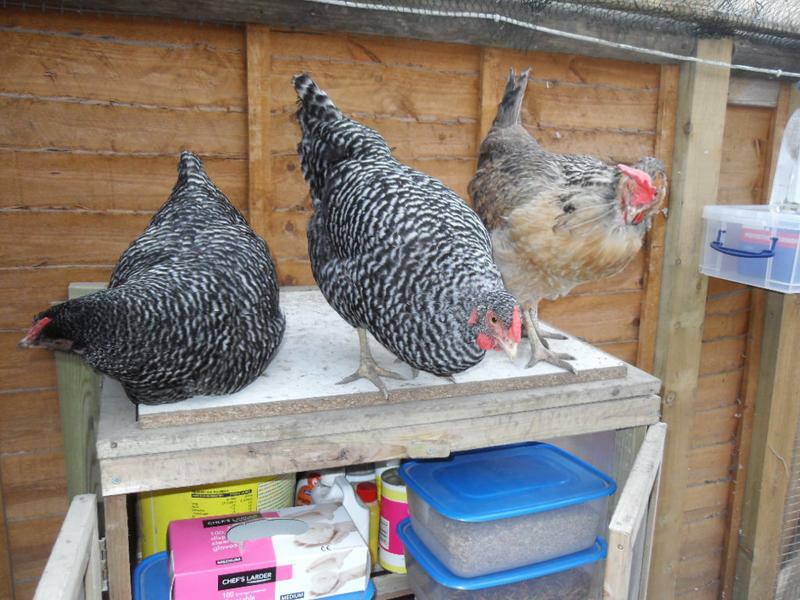 These photos were taken before Pepper stripped Dotty’s head of feathers. With all the space on a farm and a big flock we were confident this behaviour would stop. Now that the big girls had gone the run looked huge and empty with just four little girls. My husband said that after all the expense, time and effort we had put into the run we may as well get some more little girls to fill it. I phoned the lady I had got Amber and Honey from as I remembered that she had lots of bantam brown leghorns the year before. She said she had plenty of chicks that would be ready to leave their mum in a month’s time. I said I would like two and would call her each week to see how they were progressing. A month is a long time to wait and I know not many farms near me breed bantams but I knew the farmer that we got Topaz and Sparkle from used bantam game fowl as his brood hens. It was a long shot but I called to ask if he would sell me two of them. 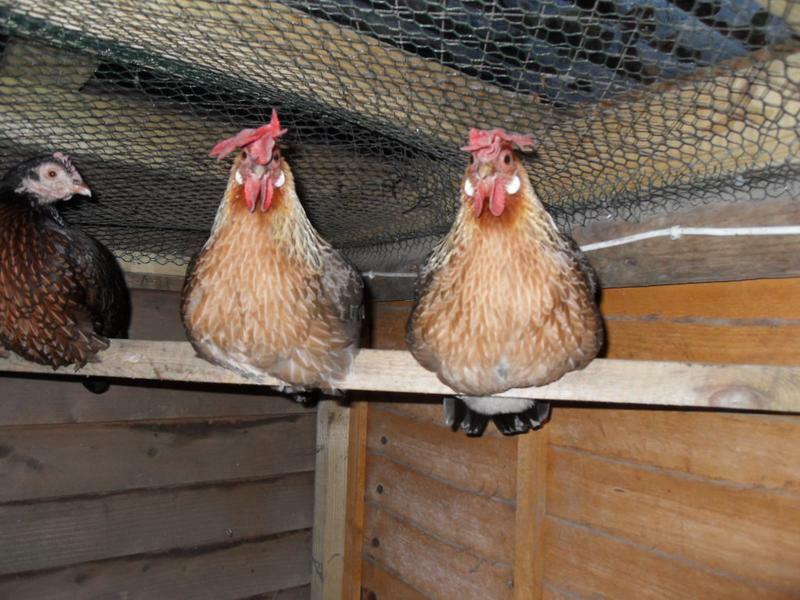 He said that he had a batch of game chicks for himself and would be happy to sell two of last year’s birds and that we could collect them straight away on 11th June 2014. I chose one of each of the two types he had and within days they were happily integrated into my flock. Once again I went with descriptive names and called Toffee for her brown colour and Emerald for the glossy Emerald green sheen to her feathers. I was really pleased with my new girls and how happy my little flock was. The little girls would now have a chance to grow their feathers back and look beautiful again. On the last weekend of June 2014 the two brown leghorns were six weeks old and ready for me to collect. I collected them on Saturday 28th June 2014 at five o’clock and kept them in the dog crate up against the little coop in the separated area for the first evening so that they would know where to sleep. That made no difference as once I let them out the next day they explored and they never returned to the little coop. They chose to roost in the flower pots as they were the highest spot and I lifted them down to the little coop each night. I continued with my theme of descriptive names and named them Peaches and Barley because of their gold and peach coloured breasts. They were so beautiful and so cute. Peaches and Barley started laying eggs at six months with Barley starting two weeks ahead of Peaches. Peaches has remained slightly bigger than Barley but Barley has a slightly bigger comb. Barley is on the left and her comb flops to the right, Peaches is on the right and her comb flops to the left. This makes it really easy for me to tell them apart. Peaches and Barley like to jump on my back whenever I stoop down. I think it’s because I have had them since they were only six weeks old. I quite like it as it means that they want to interact with me. 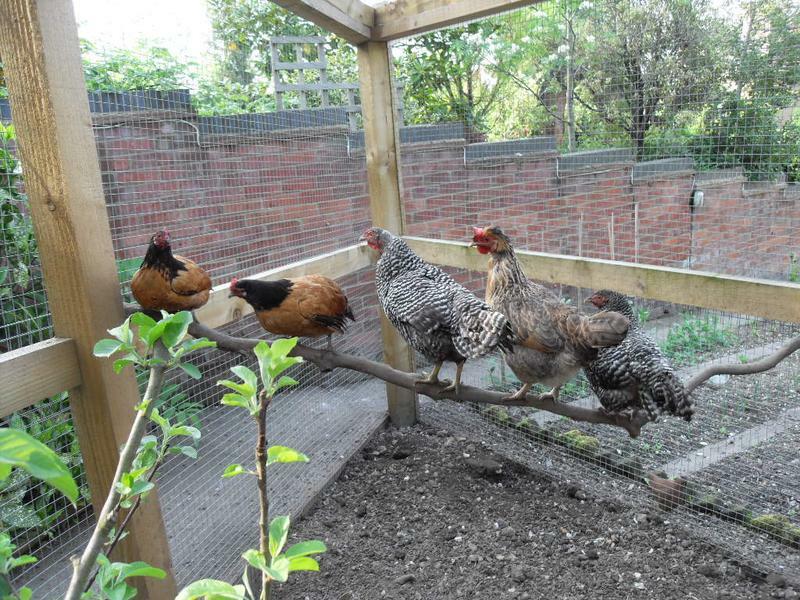 My flock of eight bantams is complete and the adventure continues. On 25th April 2015 I went out to the girls to find Amber’s dead body just outside the pop hole. This was a total shock as she had been fine the day before with a red face and comb, chatty, lively, good appetite, dust bathing, scratching and doing all the usual things. I put her in the coop as usual at bedtime and found her in the morning. We had had her for two years and she had always struggled to lay her eggs so we knew she would probably not have a long life but this year she laid one egg five weeks before this and then stopped laying. It is good that she didn’t suffer, we didn’t have to take her to the vet or make any difficult decisions but it was a shock. There was nothing obviously wrong with her that we could see. We buried her in the garden. We will miss her cute little face and endearing ways. On 26th June 2015 I had to make the heartbreaking decision to have Sparkle put to sleep. Only two weeks after Amber died Sparkle looked unwell and on inspection I could hear a crackle in her breathing. I took her straight to the vet and he said that her chest was clear but he would give me a course of antibiotics for her. After the antibiotics she seemed a little better then went down hill again. I then found a worm in the poop so I wormed all the girls. Again she seemed to get a little better. Sparkle then laid an egg with no shell and from then on she deteriorated. She stopped eating pellets and would only eat treats. She then would only eat the morning and bedtime corn or sunflower seeds and then finally would only eat the morning corn. She spent her days just sitting on the run floor or on a perch often dozing. I tried putting her in the cat box with dishes of all her favourite things and I tried putting her in a separate part of the run so that she didn’t have to compete with the girls but nothing would entice her to eat. By now it had been seven weeks and even if I held her favourite food items in front of her beak she would just turn her head away. She felt really thin and I knew if this continued she would just starve herself to death. I couldn’t let her suffer any more so had to make the agonising decision to have her put to sleep. I held her in my arms while the vet gave her the injection underneath her breast. She fell asleep in my arms as I talked to her, stroked her and cried over her. The vet said that I had made the right decision but it didn’t make it any easier. I knew in my heart that she couldn’t recover and this was the kindest thing for her but it was really hard. Sparkle was still beautiful even in ill health and had the fluffiest bottom of all my girls. I missed her beauty in the flock and it was difficult losing two girls in the space of two months. Now I had a flock of six. Read on in “The history of the flock part two” to see new girls being added to the flock. I can’t believe how the time has gone by , how much has happened and how much we have learnt . Every day is different and always something new to worry us. Blossom has settled down really well and is now one of the flock. My girls pecking order has not changed except blossom being at the bottom I suppose but i n the last week that does not notice so much. . They all seem the same except old girl Clover who is top and only has to give the look and they all get sorted . I think we are lucky . I too can’t believe how much change there has been in the last two years. I thought I would get my chooks and it would stay the same but things evolve. We have learned so much though and there is so much joy we get from our girls, as well as the inevitable worries too. Hi Carol, Tim and I just wanted to drop you a note saying how brilliant we think your blog is. I have really enjoyed reading about all of your chickens, made me smile.